SILICONE LID: FLORL LID COVER 4"
SKILLET W/ ASSIST HANDLE: 12"
A kitchen's most essential item. 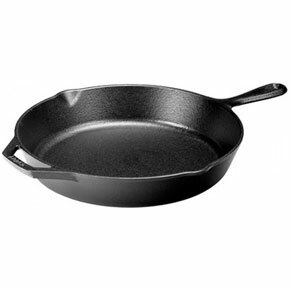 Skillet w/assist handle, 12" dia., Depth: 2". Pancakes, eggs, and bacon somehow taste extra hearty when cooked in a heavy cast-iron skillet. Cast iron creates superior heat retention, heats evenly, and loves a campfire, unlike flimsier pans. Fry up a mess of catfish, roast a chicken, or bake an apple crisp in this generous 12-inch pan that features two handles for heavy lifting, and two subtle side lips for pouring. While the skillet comes preseasoned to prevent food from sticking, it works best when sprayed or lightly coated with vegetable oil before use. Whether used in a kitchen or camp, this virtually indestructible pan should last for generations.